Tilt-shift photography can be used for many things, but one of the more interesting is a technique used to trick the mind into thinking very large things are very small. Tilt-shift takes advantage of our familiarity with very close up images of small things, where the object of interest is in focus, but everything else is progressively blurred. 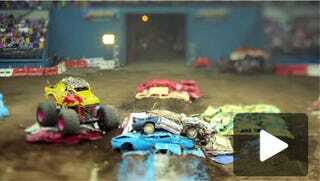 Keith Loutit has applied this technique in video form to an indoor monster truck rally and demolition derby event with stunning and awesome results. The full video below in huge format for your viewing pleasure.